The Volga Germans have never received financial compensation for the loss of their property after their deportation in 1941, or for the psychological, spiritual, and emotional damages caused by the murder of their relatives. Their autonomous republic, villages and land have never been returned to them. Their traditional ways of life, language, and culture in Russia and Central Asia are all swiftly heading towards extinction. 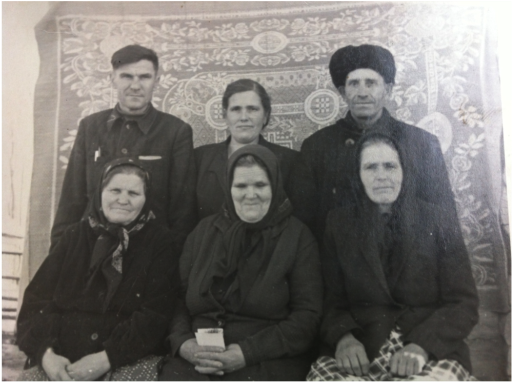 families from Norka who were living in Gonokhovo (Siberia) in 1980. Photograph courtesy of Marina Webber. By Stalin’s standards, these events may seem on a minor scale, a mere annex to the main structure of terror. The really significant point is that this time it was not individuals but whole nations that were purged. part.” In 1991, the Russian government publicly admitted that the deportation of the Russlanddeutschen and other peoples did indeed constitute genocide. The Germans born on the Volga and their descendants are now dispersed around the globe. We mourn the loss of our ancestral homeland in Russia, and acknowledge that it will never return. The noted Volga German author, Peter Sinner, poignantly expresses the emotion felt by many. To the earth of your home." Last updated June 7, 2017.